Showcase your products and services to the sleep medicine community by taking advantage of the advertising and sponsorship opportunities available through the American Academy of Sleep Medicine (AASM). The Journal of Clinical Sleep Medicine (JCSM), the official publication of the AASM, features articles that are relevant and applicable to the clinical practice of sleep medicine. This includes clinical trials, reviews, commentary and debate as well as proceedings from AASM-sponsored conferences, workshops, and symposia. The publication is the premier peer-reviewed scientific journal that is read by a wide audience of doctors, technologists, researchers, scientists, nurses and sleep center managers. Each issue of the monthly publication has approx. 26,400 viewers per month – JCSM has an impact factor of 3.429. To secure your ad space in JCSM contact Chris Waring, National Sales Manager, at 630-737-9731 or cwaring@aasm.org. For additional information on ad specs and rates, go to pages 3-10 of the Media Guide. The AASM created Montage to provide members with a variety of content including; highlights of the latest in sleep medicine news from both the AASM and associated sources, interviews with members and staff, fun sleep medicine facts, and social media updates and pop culture references. Montage is printed and mailed directly to AASM Individual and Sleep Facility members in the United States (approx. 10,000+) quarterly (February, May, August and November), it’s also posted online. Each publication offers advertisers two premium ad placements to choose from (inside front cover, outside pack cover). For additional information on ad specs and rates, go to page 16 of the Media Guide. SleepEducation.org is a sleep health information resource for patients and the general public, published by the AASM. Advertisers are invited to secure display space for their products/services on a special webpage on the site: Sleep Product Guide. For additional information on specs and rates go to page 11 of the Media Guide. Looking for an advertising opportunity in a printed format? The AASM Roster of Accredited Member Centers is the way to go! The Roster is a complete listing of all AASM accredited member sleep centers and is published twice per year (April and October). It is mailed to a national audience of more than 4,500 – AASM accredited sleep centers, large employers and insurance companies. Only full-page ads are accepted per issue. For additional information go to page 19 of the Media Guide. The AASM offers organization with exhibiting opportunities at its Sleep Medicine Trends and Board Review courses. Exhibitors have the opportunity to support the educational programs and share their message with the attendees and the sleep medicine community by securing sponsorships and advertising. 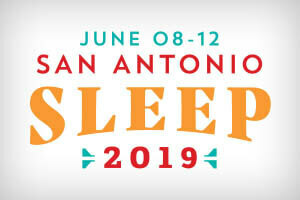 The Annual Meeting of the Associated Professional Sleep Societies (APSS) is the premier event in the field of sleep medicine and sleep research. Each year, the SLEEP meeting attracts over 5,000 doctors, researchers, clinicians, technologists, students and other sleep professionals. The annual meeting offers exhibitors with sponsorship and advertising opportunities to expand their message to the sleep medicine community. For additional exhibitor information go to the exhibitor webpage of the SLEEP website. For Additional sponsorship and advertising opportunities go to the sponsorship webpage of the SLEEP website. Upon receipt of your sample mailing piece and completed forms the AASM will review your request. The AASM will NOT review a mailing list request unless the order form and agreement(s) are complete (including payment), signed, and a sample is attached. Use of the AASM mailing list is contingent upon approval of the mailing piece. Please allow two weeks for processing. For additional information go to page 18 of the Media Guide. Visit the new AASM Career Center. For additional information and specifications on advertising and sponsorship opportunities contact Chris Waring, National Sales Manager, at (630) 737-9731 or cwaring@aasm.org.